The strings in this section feature tapered tail ends. DR Long Necks feature a 3" Tapered tail end. 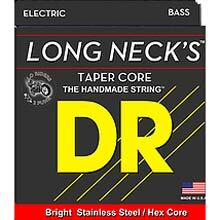 The taper section is intended to go over the bridge saddle resulting in a string that achieves a proper witness point with less effort during installation and also allows for larger gauge strings to be installed on strings that require a greater break angle over the saddle. The tapered strings are identified by a "T" after the string size. Example: .125T specifies this specific string is tapered. Please reference the item description for individual string gauge listings. Any questions at all please do not hesitate to ask Fret Nation!